What are door entry systems for Schools? Door entry systems for schools are essential for safety and security across establishments for all areas of the school, not just for access to the ICT suite. With a multitude of access options, and health and safety obligations, SchoolCare are happy to be able to assist with the provision of Paxton smart access control and door entry systems. Options range from an advanced one cable door entry system which includes built in access control functions to Networked Access Control systems. 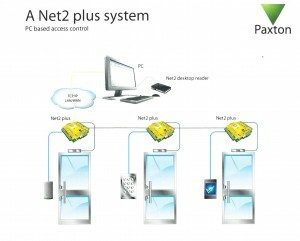 Paxton’s Net2 Plus system offers an IP ready wired single door controller which allows a direct connection in to the network. Net2 Nano offers the option for a wireless single door controller, using a Net2 Air bridge. Net2 Plus Control units are required for each door. Every control unit can control up to two readers and two keypads. Options for access include proximity cards, keyfobs,and magstripe cards. Keyfobs and proximity cards can be programmed to only allow access to specific areas, when using the Net2 desktop reader and Net2 Software. The desktop reader is a USB device and does not require a separate power supply – this is helpful in a limited office environment. Tokens or Cards can very easily be barred from the system if they become lost, reported stolen, or simply not returned by a visitor or employee who leaves. Users can be restricted to certain areas dependent on time of day, or all doors can be unlocked at a given time. Paxton offer Net 2 Pro software with additional functionality such as integration with fire alarm integration, multizone intruder alarm integration and the ability to utilise Net 2 Anywhere web access. Also Net2Pro has a built in card designer. SchoolCare can offer full design and installation services for door entry systems for schools – be it for a simple single door system, or integrated across the whole school site.